Housed within the über trendy London Edition hotel, owned by Brooklyn born Ian Schrager, the man behind New York nightclub Studio 54, Berners Tavern in Fitzrovia is a fantastic pace to people watch. Housed in a former ballroom, the restaurant is characterised by its Belle Epoque ceiling, chestnut mohair banquettes, ornate bronze chandeliers inspired by the ones hanging in Grand Central Station and floor to ceiling amber-backlit bar. 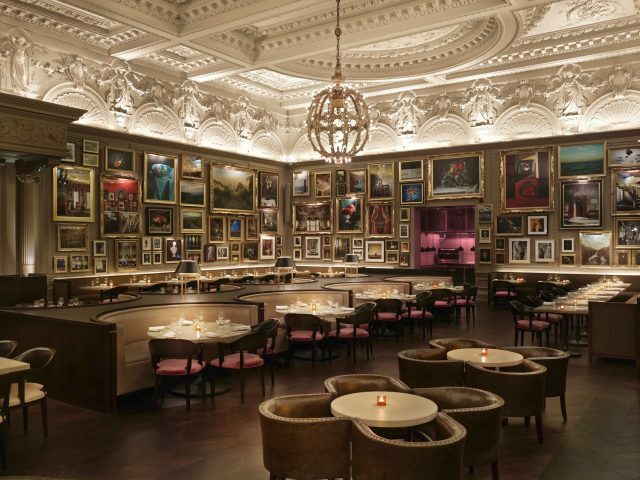 Jazzing up the walls is a collection of quirky artworks piled on top of each other in golden frames conjuring a snapshot of how the Royal Academy looked in the early 1800s during its annual exhibition. Housed within the frames is a range of images from lemons and lion heads to books, busts and even a mustachioed man and his dog.